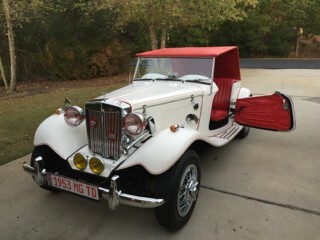 I also have a London Roadster and the tonneau cover from MG Magic fits nicely. I’m very pleased with fit, quality, and price. I think it was $195.00 best I can remember. The Foamular board is covered with a painters drop cloth canvas glued to it with Loctite #200 spray adhesive and painted to match trim. A little conduit, canvas, paint and Red Neck creativity = a new Bikini Top! Hey J,It is a tubular chassis. I bought it 2 weeks ago today in Virginia Beach, VA. 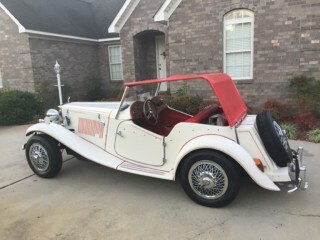 It is like new and a blast to drive (white with red interior and trim). The only issue is it bottoms out in the rear and I need to correct this. 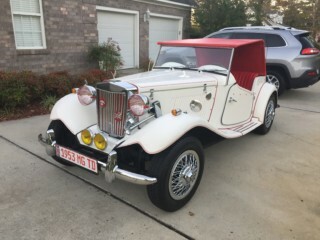 Are there any MG clubs in or near Fayetteville? I will post pix after I figure out how to do so.